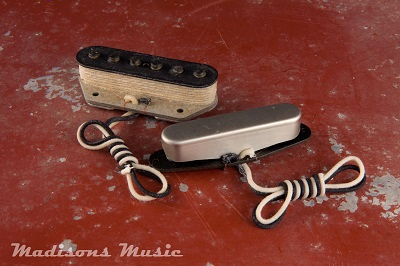 Our Pre CBS grey bobbin Telecaster pickups are based off that infamous 60's Telecaster tone. Slightly overwound in comparison to our 50's set. Hand wound with lacquer dipped bobbins. Alnico 5 magnets with staggered poles. Our 60's Tele pickups offer that natural bell like tone you expect out of an early Tele. Nice noticable mid range and clear overtones. Our aged pickup can be aged to any level of distress.